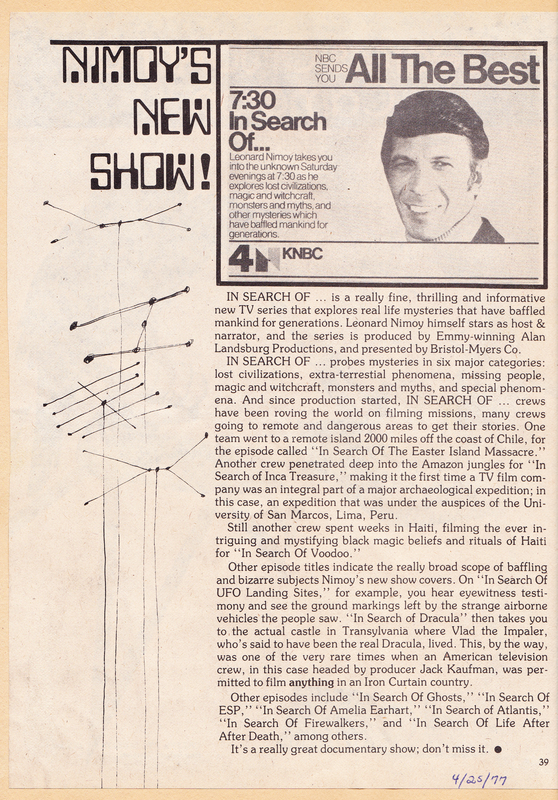 Here’s today’s flashback: A 1977 review from Starlog magazine of Nimoy’s new weekly documentary series “In Search Of...” ( I can still hear the theme song) And more delays on that supposed Star Trek movie. Roddenberry wanted a script that would please the fans, but Paramount found his original script “too much like a TV series”. Unfortunately, the final result was too much like a a very slow, very boring documentary, not like the original at all, (and don’t get me started on those hideous footie-pajama uniforms!) Glad Wrath of Khan came along in ’82 as of much better representation of what Trek should be. In Search Of… was an interesting series, although I’m sure much of its info is outdated now. The episode that really bugged me was about a cult around ‘St Germaine’; creepy. As a youngster, I was willing to believe that there was a Loch Ness Monster, and maybe even that ancient civilizations etched big pictures into the deserts to communicate with aliens, although I mostly watched for the Nimoy segments. In a later episode, Nimoy ‘searched’ for Vincent Van Gogh, and cleverly plugged his new one-man-show Vincent. 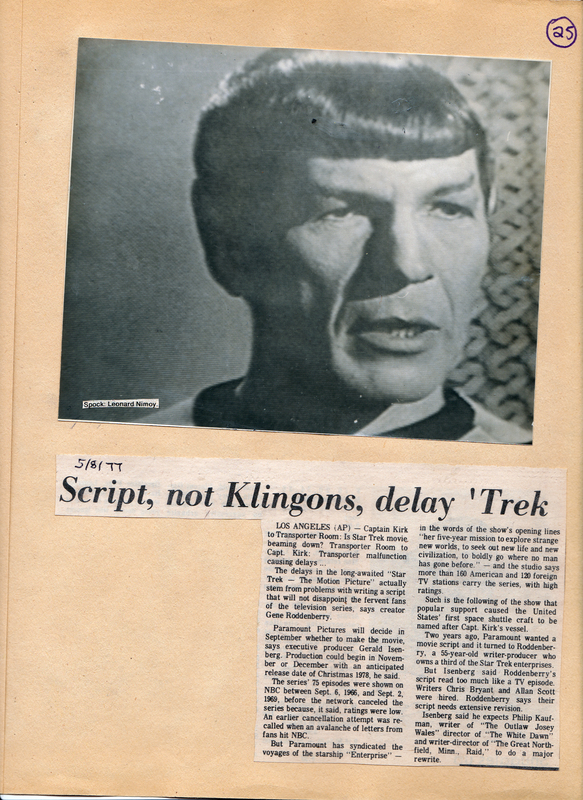 This entry was posted in My Star Trek Scrapbooks and tagged In Search Of, Leonard Nimoy, ST:TMP. Bookmark the permalink.